The skin of an eggplant can be eaten, but it is best to eat it when the eggplant is young. Older eggplants are more bitter and become more discolored. Because of this, older eggplants should be peeled before eaten. 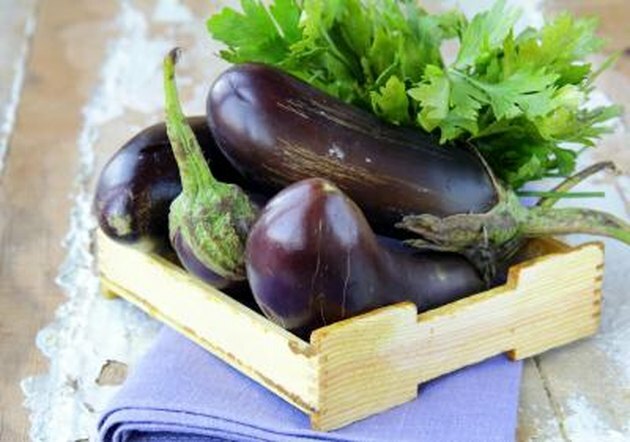 The eggplant doesn't contain a lot of nutrition; however, it is low in calories. One cup of raw eggplant contains 188 milligrams of potassium, 7 milligrams of calcium, 11 milligrams of magnesium, 18 micrograms of folate and 2.5 grams of dietary fiber. You will get more fiber by eating the skin rather than peeling it. When looking for an eggplant, make sure the skin is smooth and evenly colored with bright green stems. Tan spots may be spots of decay. Choose smaller eggplants so they will be less bitter. Don't cut the eggplant until you're ready to eat it unless it is being frozen. It can be frozen for up to six months. White eggplants are smaller than the purple eggplants and are usually more tender. They are also creamier than purple eggplants. White eggplants have a tougher skin and need to be peeled before consumption.